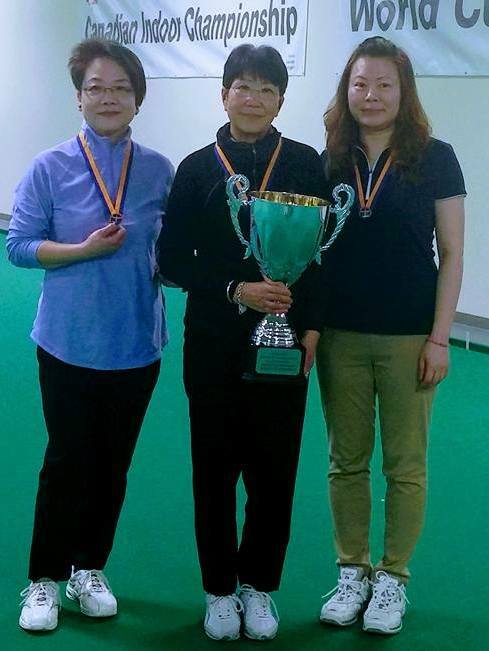 It was a great weekend of Indoor Bowls as the Women took to the carpet to try and win the Singles Crown. Having a 3 tournament schedule (Triples, Pairs, Mixed) everyone was tuned up ready to roll in this individual competition. This is a direct qualifier to represent British Columbia at the Canadian Indoor Championships which will be held later this year on October 29th – November 4th at the PIBC. In the final match it was Rainbow Lung taking on Linda Ng. The final game went into a tie breaker with Rainbow remaining steady and coming out on top. This is the first Provincial Indoor Gold for Rainbow and we wish her luck heading into the Canadians. For Linda it was another improvement on her impressive early career as last year she took home the Bronze Medal. She will also represent BC at the Canadian Indoor Championships. In the Bronze Medal game it was Jenny Siu who got over there line as she played in a spirited match vs young gun Emma Boyd. This went down into a tie break also as the two competitors were matching bowl for bowl throughout the game. Congratulations to the all the competitors and a huge thank you to all the Umpires and Volunteers that made this a successful weekend.